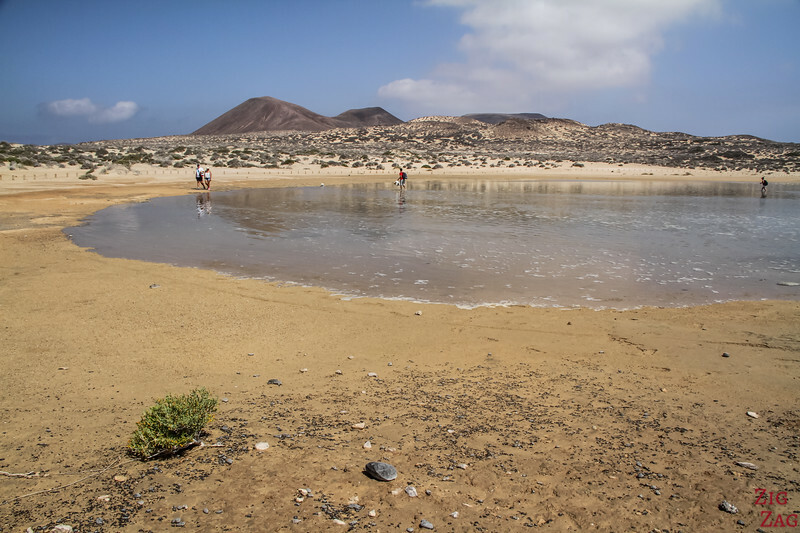 Why visit La Graciosa island? 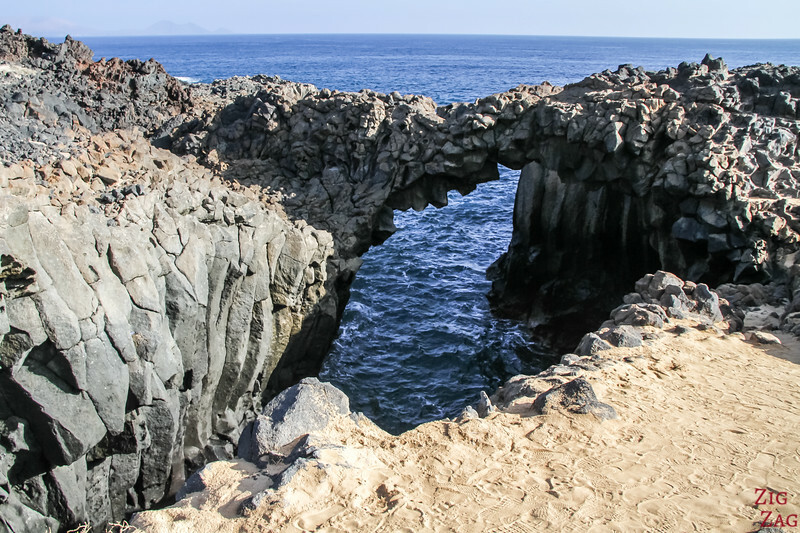 Explore the rest of the island with one of the 4WD taxis (there are no roads and only a few vehicles allowed) - don't miss the arch made of volcanic rocks! Photos of all the amazing spots to see after the practical info. The last option is to choose a catamaran tour with pick up from the resort towns. 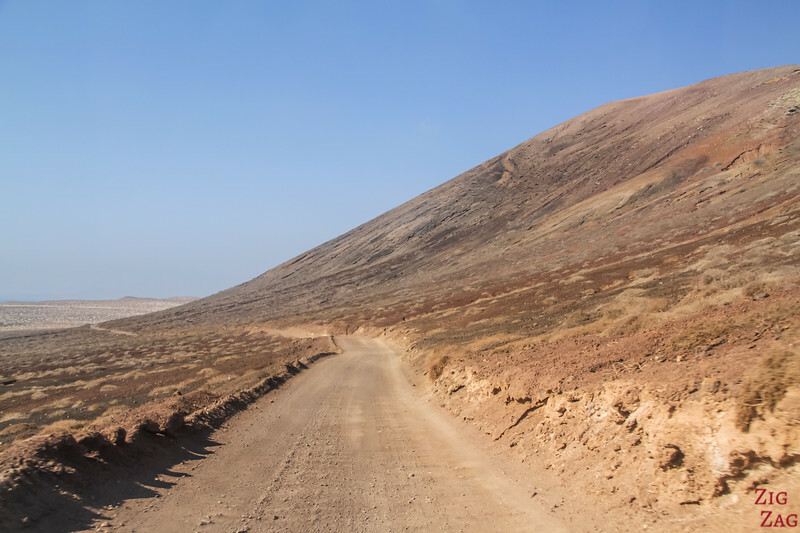 Getting around La Graciosa is not really easy. 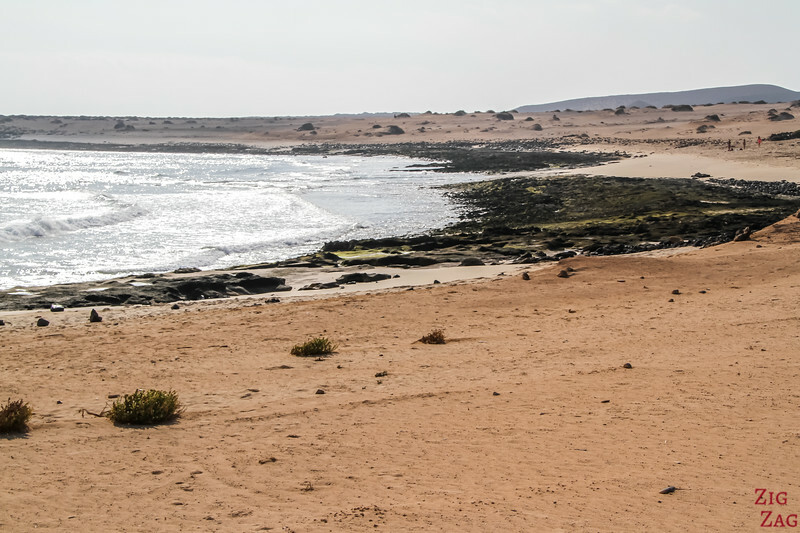 The island is small but still quite big to do on foot: 8km long by 4km wide without any shade or source of water. Note: I did not book in advance (which is not a good idea, because the number of cars is very limited), so I picked the one with several cars lined up near the ferry wharf. The drive was fine, but I did not appreciate how he was rushing for everything. Plus I tried to stop one of those car on my way back to town from Playa Francesa, ready to pay for the short drive but they did not even stop. However a few minutes later Siggy, an independent, stopped and was really nice and helpful. If you want to experience the island for a little longer or just feel like cutting from the world (although there is 4G on the island! 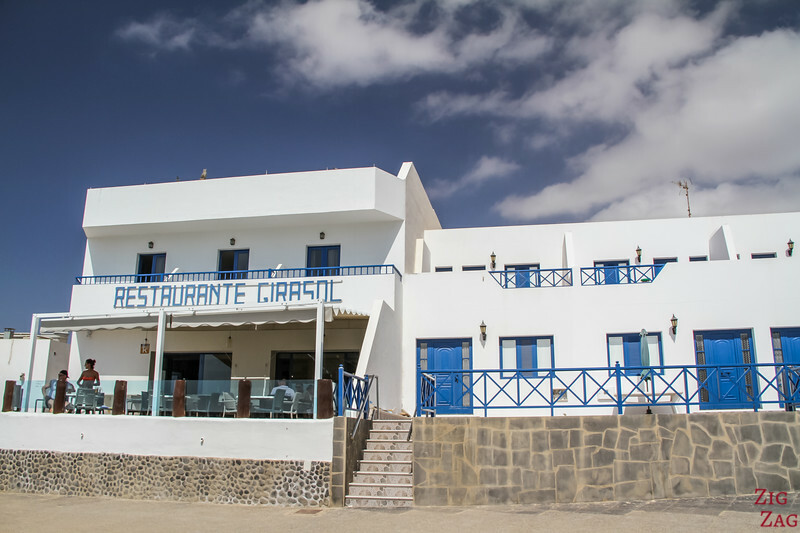 ), you can also stay for a few nights either in Caleton del Sebo or in Pedro Barba. You can mostly find rentals. 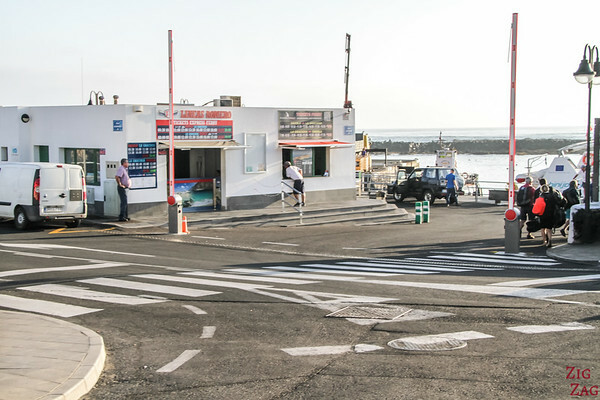 There is small shop and restaurants on the island. 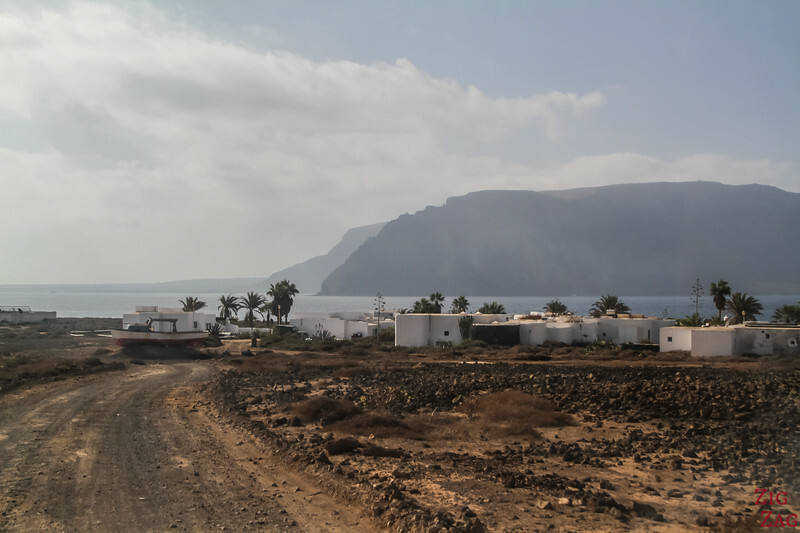 Check out the accommodations on La Graciosa island. 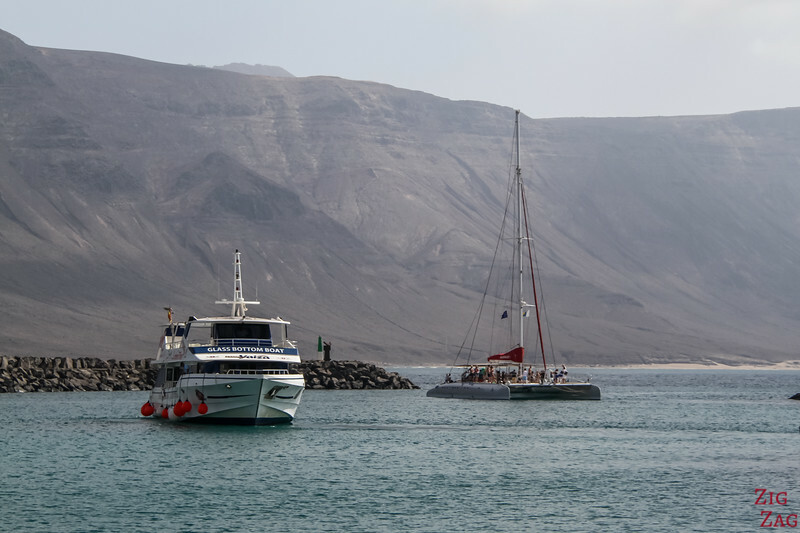 It is now time to share many pictures of the excursions to la Graciosa Lanzarote with you. Starting with the ferry crossing. There are 2 companies doing several return trip during the day. They are equivalent but take turn on the schedule. The boats are quite big and steady, with large windows. 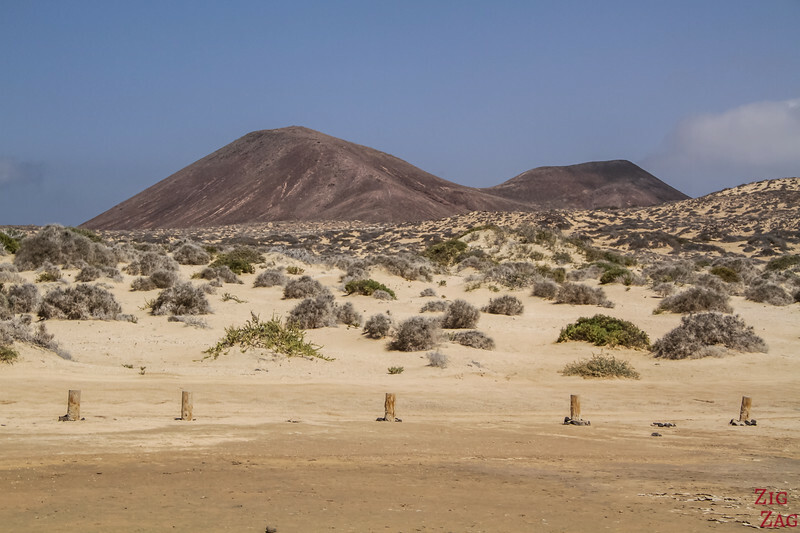 It takes 25min to cross to La Graciosa. 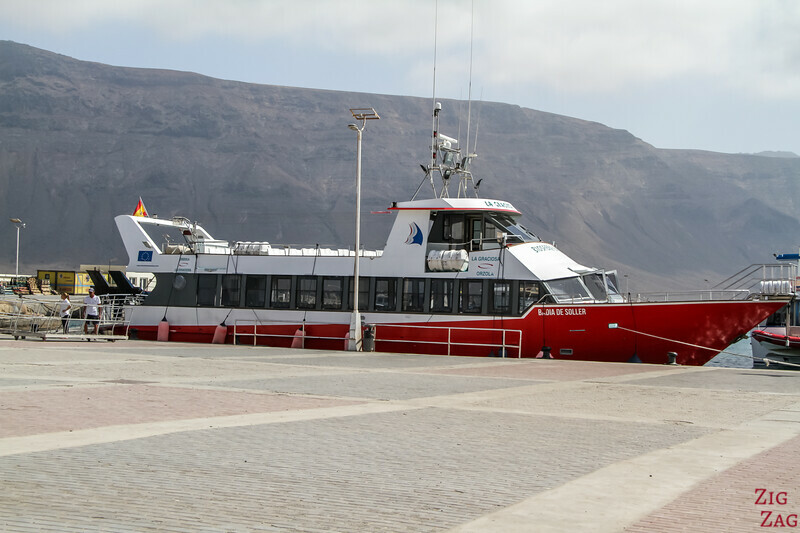 The La Graciosa ferry leaves from Orzola, a little fishing village on the Northern coast of the island. 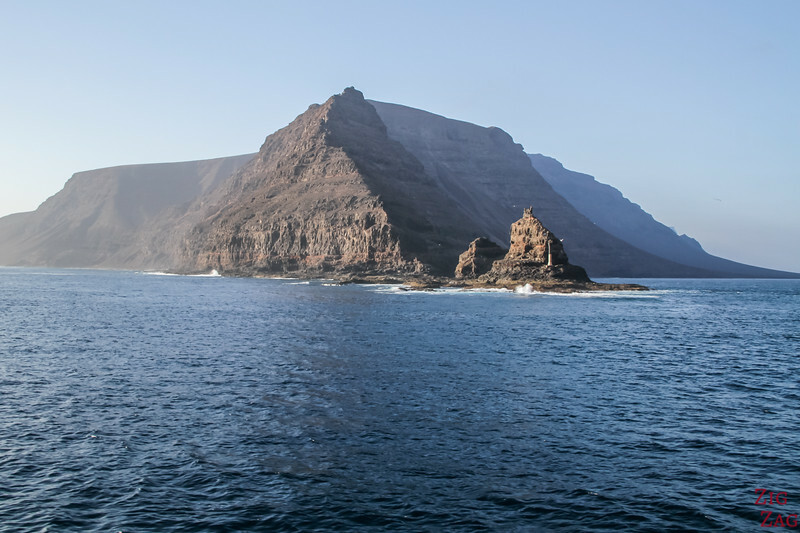 During the ferry ride, you can admire the north Coast of Lanzarote with its impressive cliffs. We have to turn around the Northernmost point that is Punta Fariones and, as you can see in the picture below, you can appreciate the cliffs on both side. Then you sail on the channel El Rio between both island (that you can see very well from Mirador del Rio). 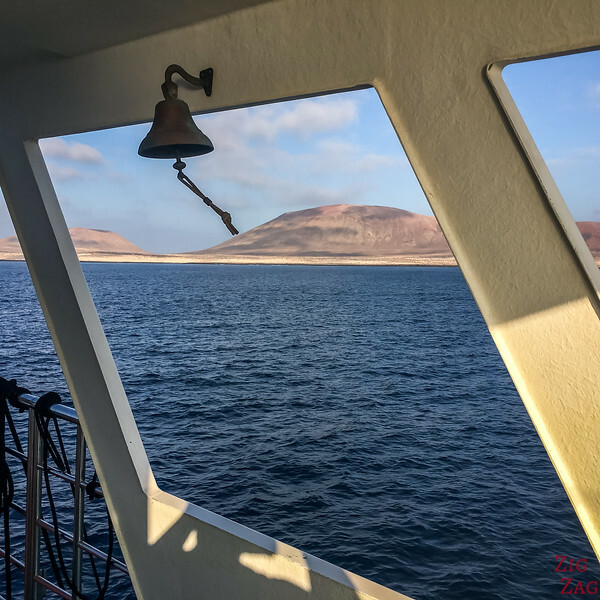 And then you approach La Graciosa. The golden sand and red volcanoes are contrasting with the deep blue of the water. It is fascinating. 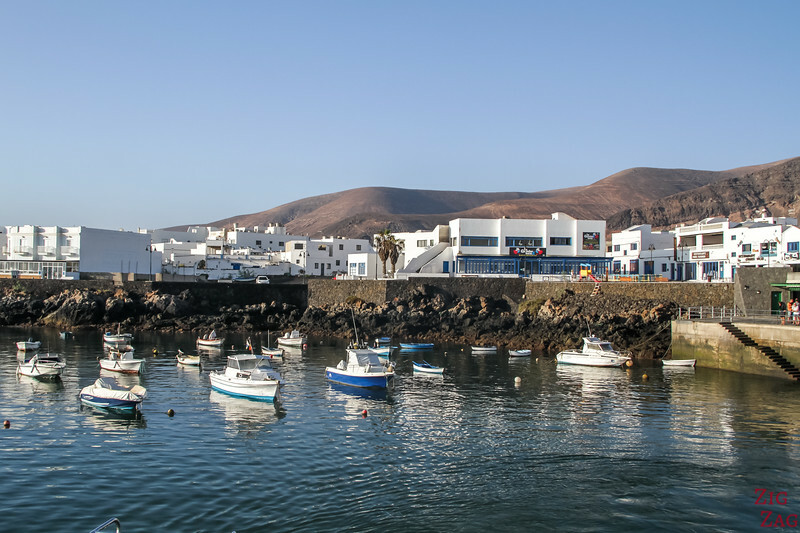 Caleta del Sebo is the largest settlement on La Graciosa island, so it is considered its 'capital'. 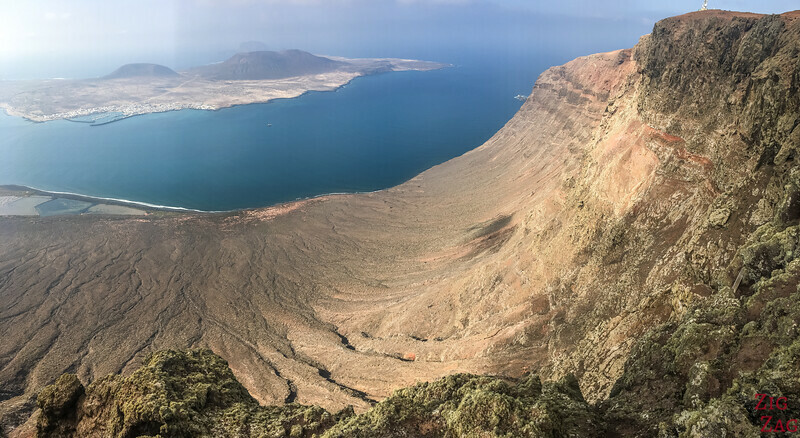 It is where the ferry arrives and it faces the Famara Cliffs. Its main activities are tourism and fishing. The streets are not paved. 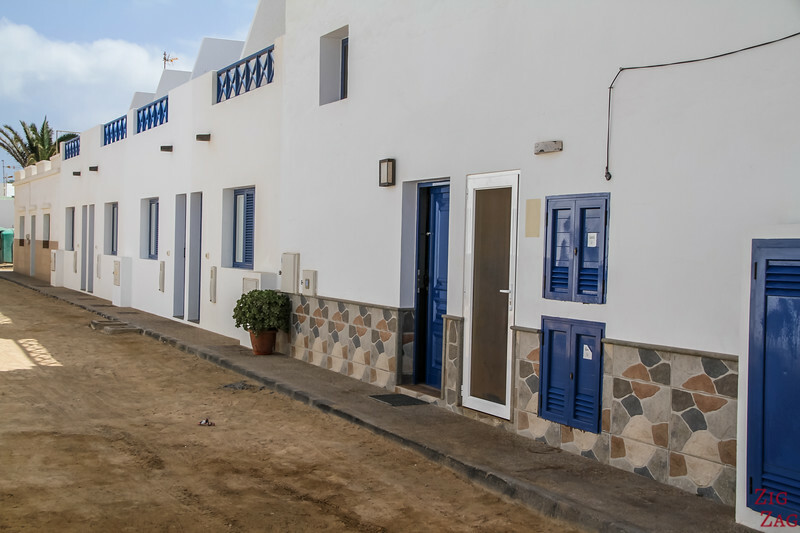 And as on Lanzarote, the houses are white with colour accents. 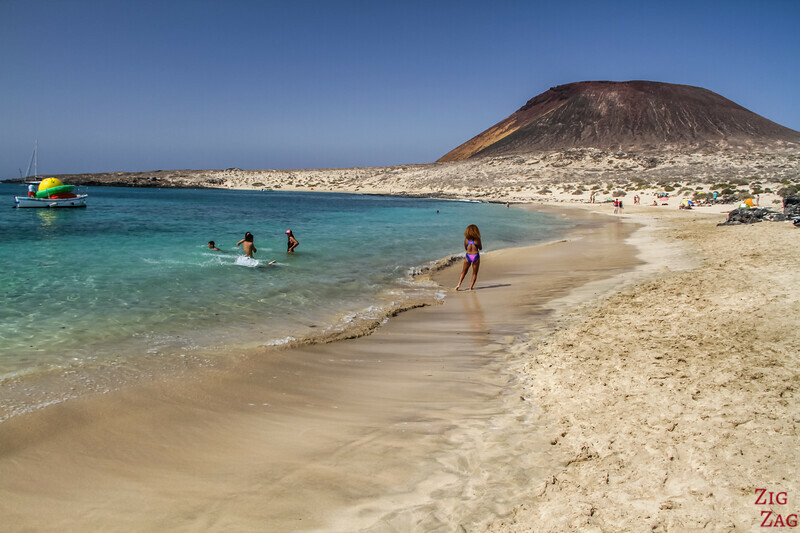 The most famous beach on La Graciosa is Playa Francesa because it is the most accessible wild beach from the port. 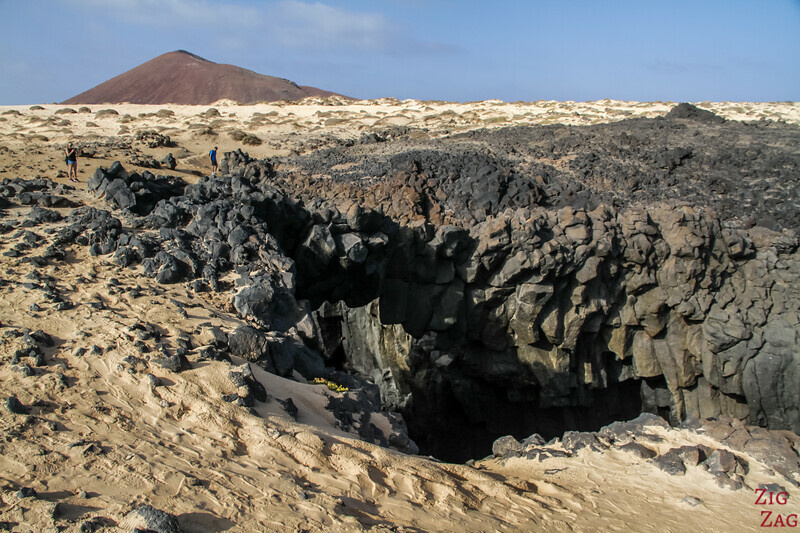 It is located to the west, facing the Famara Cliffs of Lanzarote. Below is a close up of Montana Amarilla. It is famous for its yellow side that we will see with the next beach. But I already enjoyed its color and shape from here. It reaches 178m in elevation and was created during eruptions dating back between 3000 and 5000 years ago. 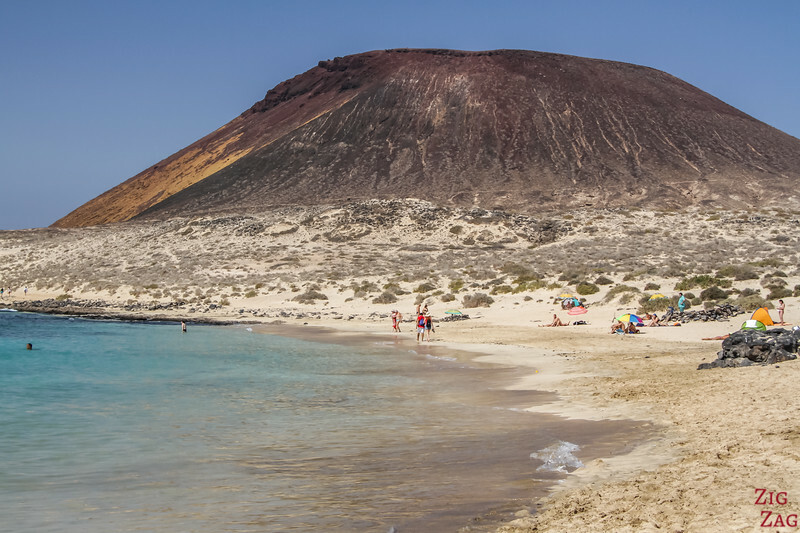 Its name means the 'Yellow Mountain' because from Lanzarote all you see is yellow. 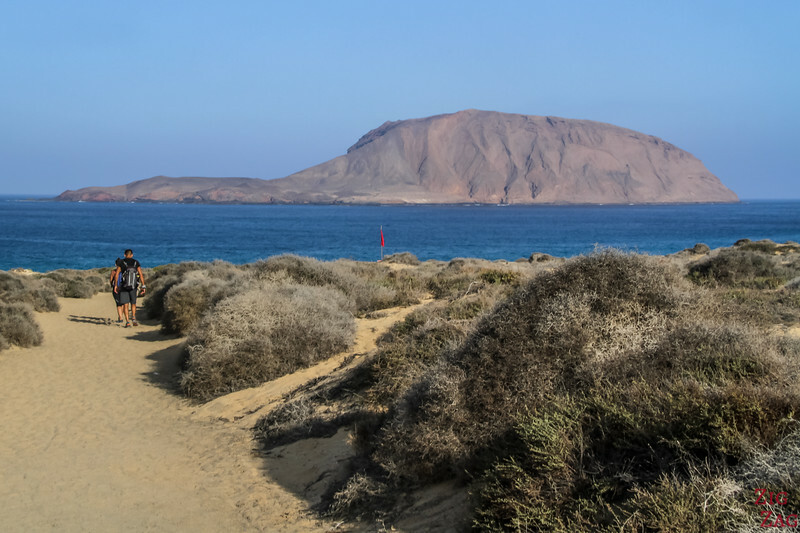 You can reach it either walking (mostly on sand) 45min to 1hour or using one of the 4WD taxi (under 10min) from Caleta del Sebo. 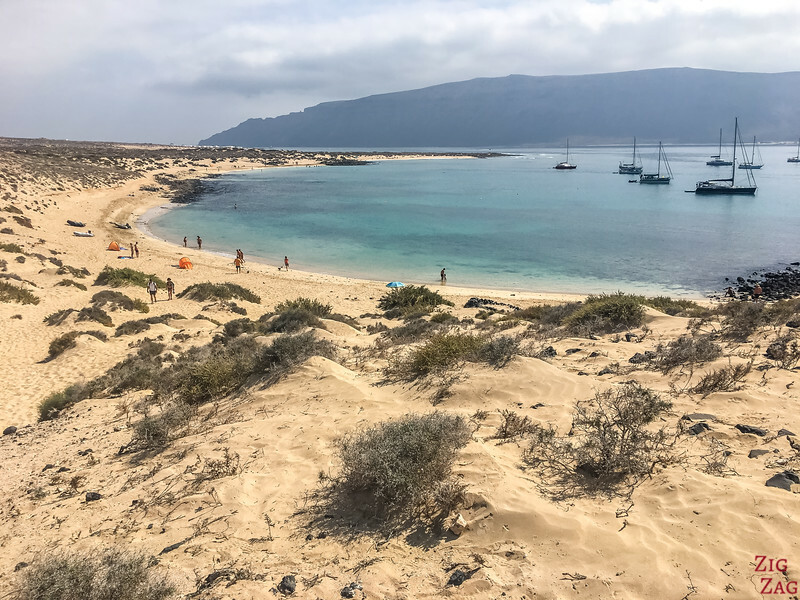 And then you can walk uphill to get to our next stop Playa Amarilla, but don't forget to look back to see Playa Francesa Beach from slightly above. 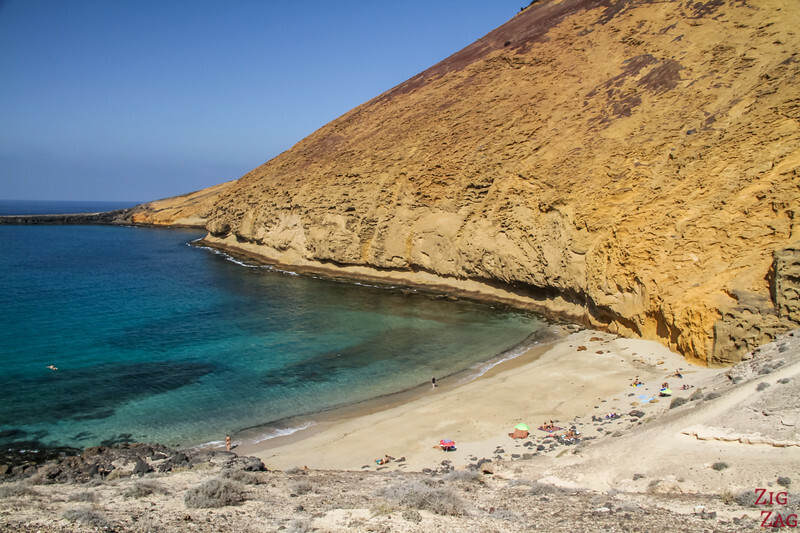 Our next stop is another La Graciosa Beach: Playa Amarilla. 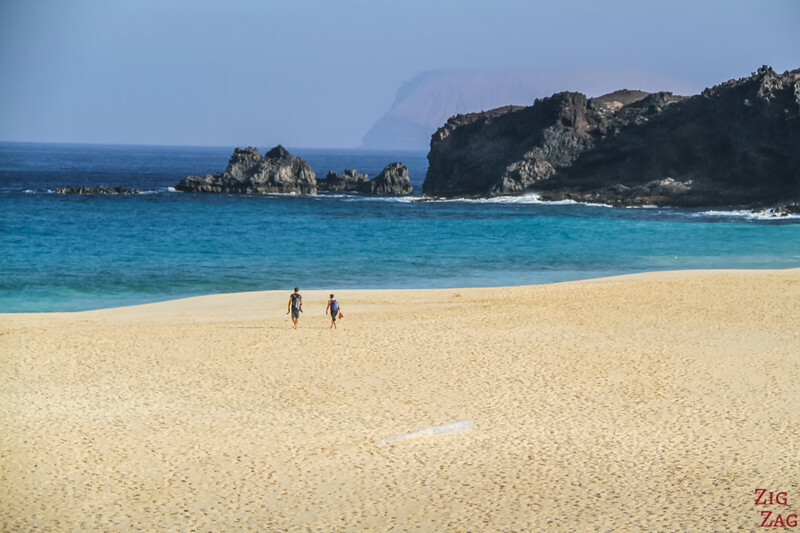 It can only be reaches on foot, 15min extra walk from Playa Francesa. At the end of the first beach, you can see a sandy path going up. Then the walk is mostly flat. 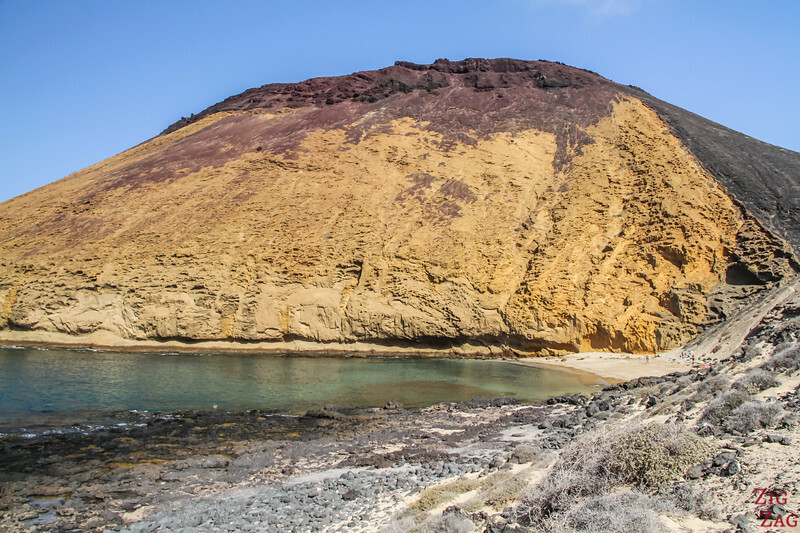 You arrive above Playa Amarilla which is in a very small bay (Bahia de la Cocina) protected by the yellow side of the volcano. Why is it yellow? Because the thousands of years of wind and water erosion have removed the scarlet layer of lava exposing the ochre tuff rocks. The colours are so vivid, it is mesmerizing! Attention, the walk down is a little bit slippery. 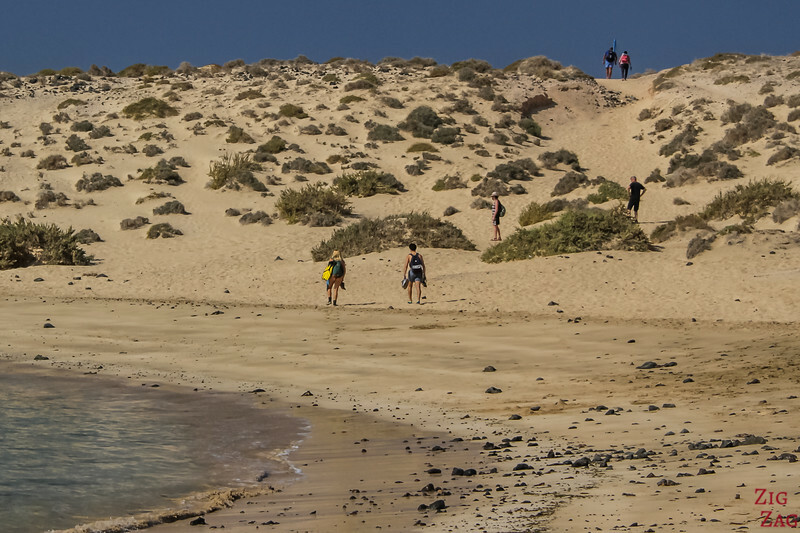 But the combination of colours and shapes in the beach makes is a unique spot in the Canary islands. Or, instead of getting down to the beach, you can walk down through the rocks to the South. This way you get a great view of the yellow mountain side. 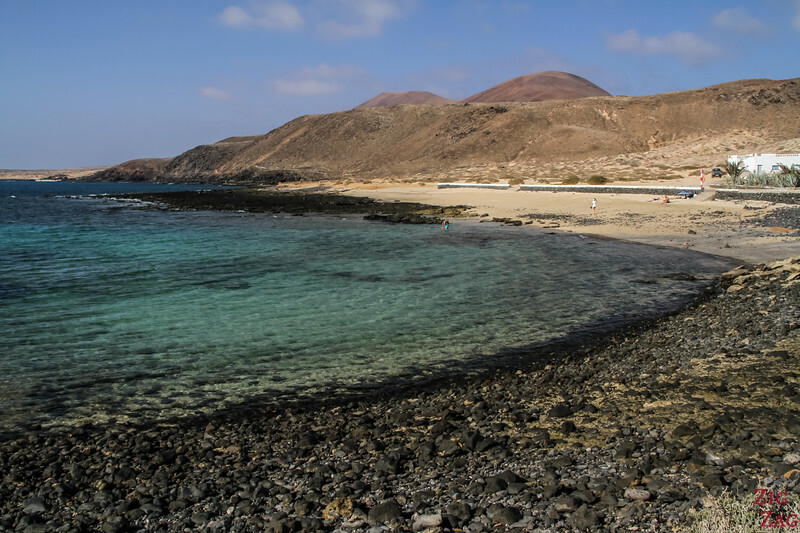 Between Playa Francesa and Caleta del Sebo is Playa del Salado along the track. It is not dreamy like the other beaches, but there is some sort of the lagoon so it is safe with kids. Note: some people try to cut through the middle for a faster way back to town, but it can get quite deep in some area, so it is better to stay closer to the beach. 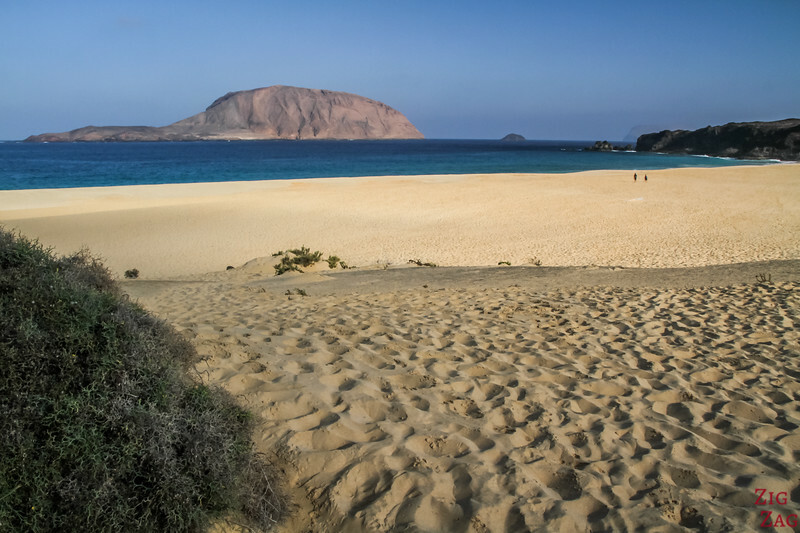 The other very famous beach on La Graciosa is Playa de la Conchas. It is located further away from the port on the North West coast of the island. 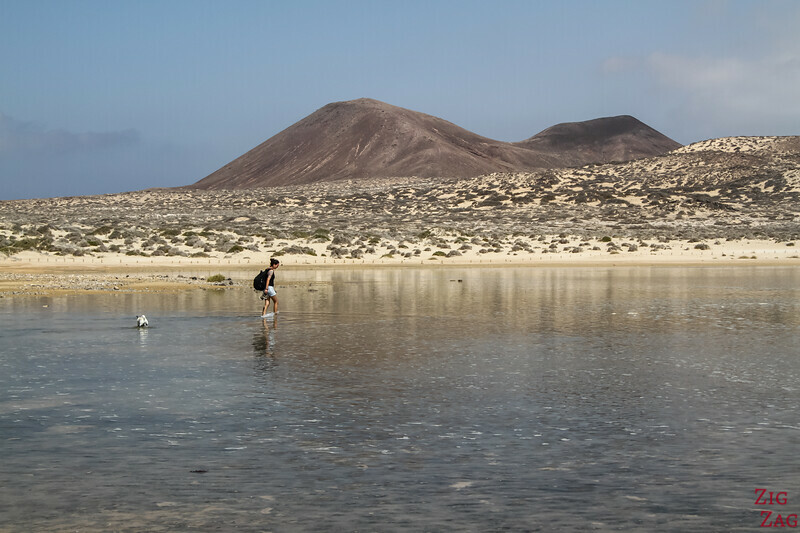 IT offers a large golden sand area and small sand dunes, view of Isla de Montana Clara, and its own volcanic cone: Montana Bermeja rising to 154m. 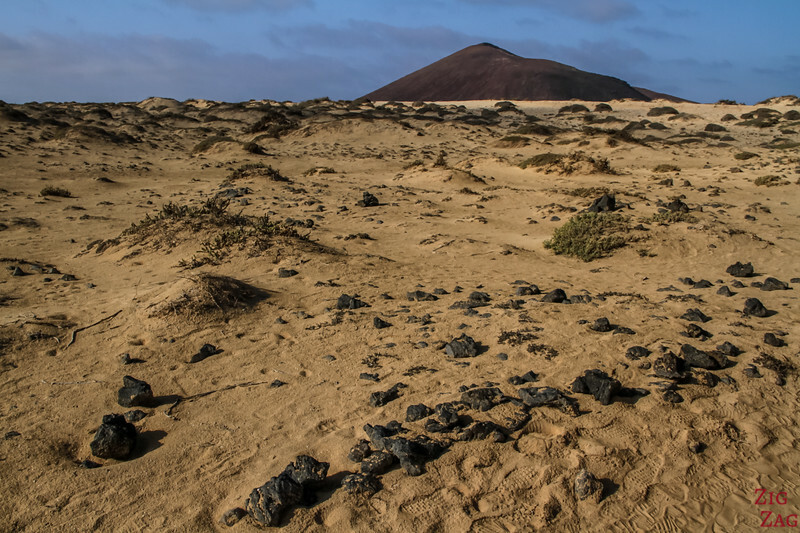 It is one of the most largest sandy area around Lanzarote - 400m long and 100m wide. Tempting, isn't it? If you look towards the North, you can distinguish the shape of another small island: isla de Alegranza, another volcano. 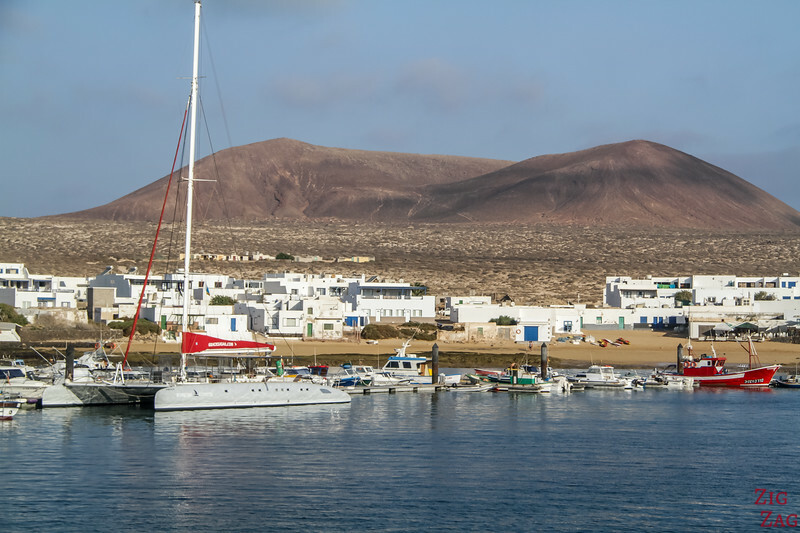 But La Graciosa Lanzarote is not only beaches. 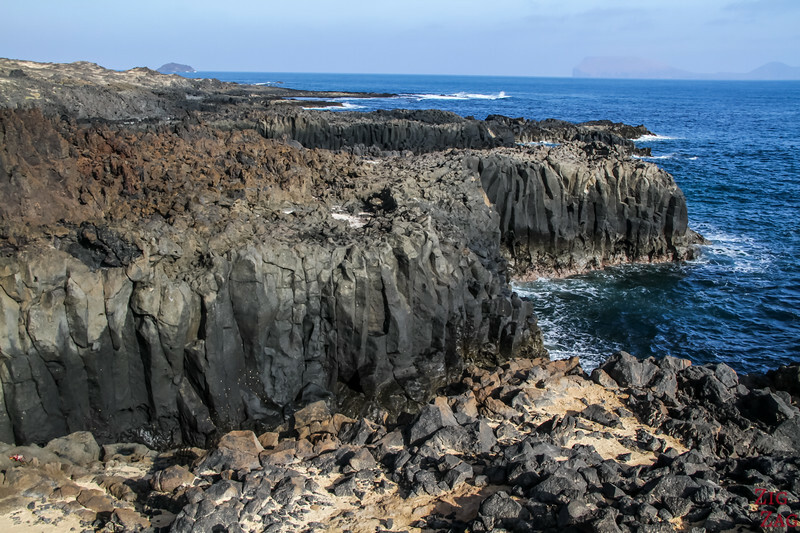 You can also find amazing cliffs where the lava flow has met the ocean. It has created basalt columns and fascinating shape including the famous arches that gives its name to Caleton de los Arcos. It is located on the North coast of the island. 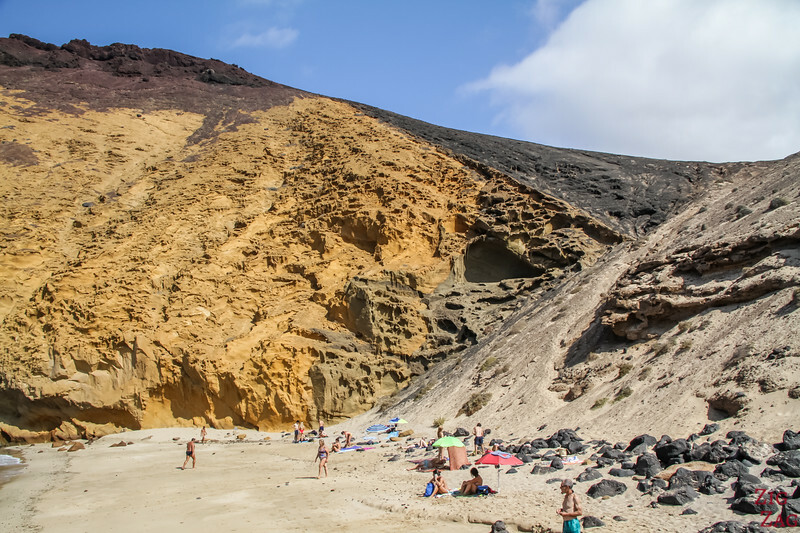 Once again I love the colours and contrast with the black volcanic rock, the golden sand, the blue sky and the red volcano (the other side of the same one with saw on Playa de la Conchas: Montana Bermeja. East of Los Arcos is La Lambra beach. Not many people come here. 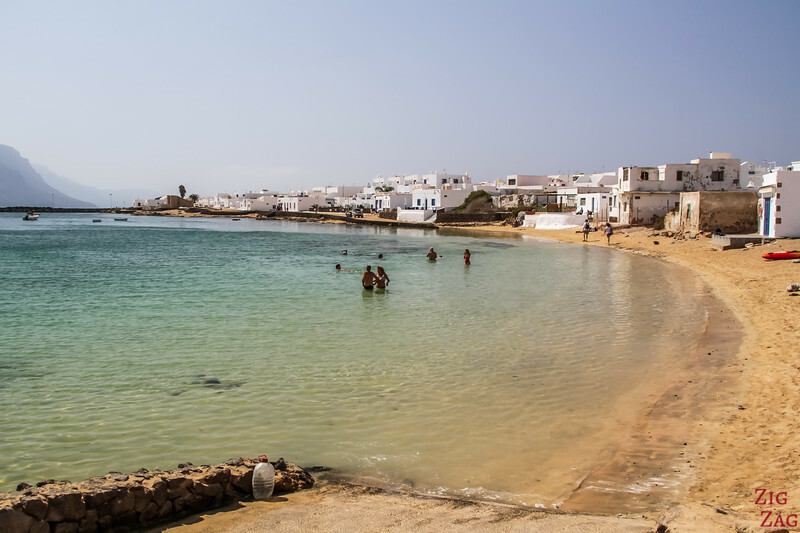 It has small white sand dunes and some rocks contrasting with the sand in this delicate round bay. North East of the port, is the original settlement of Pedro Barba. Today only a few houses make the village. And most are rental for people who want to get away from civilisation. It has a small beach and is protected of the wind blowing from the West. 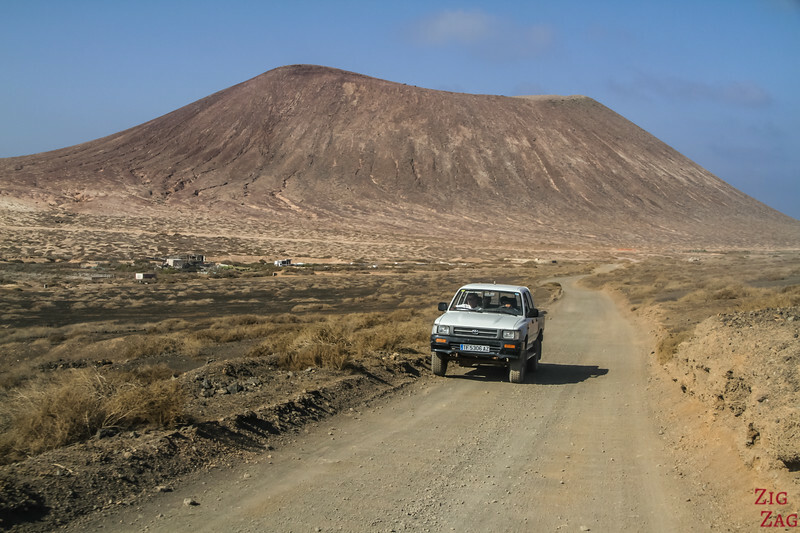 La Graciosa is really a fascinating place to explore. The landscape is dry and dramatic. To finish, below are just 2 extra pictures taken on the roads between the main points of Interests. 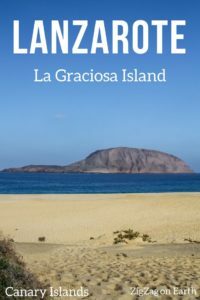 Inspired to visit La Graciosa island?